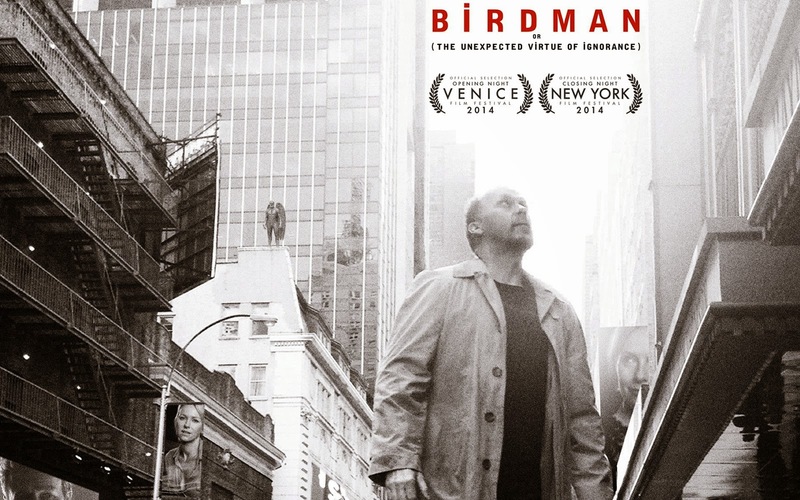 #MoviesMusicPlaysFilmFestivalsConcerts: Film Review: "Birdman or (The Unexpected Virtue of Ignorance)"
Film Review: "Birdman or (The Unexpected Virtue of Ignorance)"
Let's start this review by pointing out that the movie was filmed in one single continuous shot. Actually not but it was shot and edited in such a way that as if we were all watching one seamless, fluid take. It's a ravishing display of visual flourish. It deserves to win Best Editing Oscar! The opening sequence is a dizzying tour inside a Broadway theater as we observe a group of actors and crewmen mount a stage play based on a Raymond Carver short story. The characters are introduced one by one until we get a sense of what the core story is all about. It is a story about a has-been actor on the edge of insanity and his relationship with his daughter, his ex-wife, his girlfriend, his manager/producer, his insecure leading lady and an obnoxious actor tapped to replace another who was hit by a spotlight. The movie follows Michael Keaton's character as he tries to compose himself amid a spiraling chaos of directing and acting in his first Broadway play in a desperate attempt to rekindle the fire that made him a huge Hollywood star twenty years before. He is a walking time bomb that could just explode any moment. The tense final minutes of the film is going to test your patience and will make you wonder how the director plans to end the story. Fortunately, Alejandro Gonzalez Innaritu, the director, devised three separate endings that complement the other with a final sequence that gives us a sense that there was really no other way --- that Birdman had to fly. Another interesting topic touched on rather extensively by the movie is the role of critics in the success or failure of every Broadway show. No artist would easily acknowledge their affection for a particular critic but they would always look out for their compliments first minute they open the morning paper. It's a delicate act but it's the nature of the business. Critics don't create art, so to speak, but we set the bad art from the good and the great ones. Michael Keaton is in fine form here and may just finally nab an Oscar without ever having to go through what his character did in this fictional tale. Film Review: "Into the Woods"
PSIFF 2015: 50 Must-see films! Awards: 2014 Golden Globes Nominations! First Look: Disney Pixar's "Inside Out"
First Look: "The Little Prince (Le Petit Prince)"
Awards: 2014 Los Angeles Film Critics Winners! Awards: 2014 National Board of Review Winners!